The St. Louis Cardinals were sporting a 2-3 record as they hosted the New Orleans Saints on October 23, 1977. The Cardinals, in their fifth season under Head Coach Don Coryell, had won in double figures in each of the preceding three years and gone to the postseason twice. But they started slowly in ’77, losing three of their first four contests before winning at Philadelphia the previous week. While there was feuding between coach and owner and players complaining about their salary levels, there was also talent, especially on an explosive offense that included QB Jim Hart, all-purpose HB Terry Metcalf, and WR Mel Gray. New Orleans was coached by Hank Stram, formerly of the Chiefs, where he had enjoyed success. 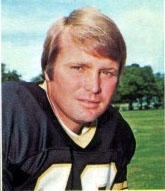 The Saints, a perennially losing club since coming into the league ten years earlier, were off to a 1-4 start and were without injured starting QB Archie Manning. There were 48,417 fans in attendance at Busch Memorial Stadium and they saw the Cardinals start fast. Six minutes into the game, Hart threw to Gray for a 38-yard touchdown. FB Wayne Morris followed up with a one-yard scoring carry at 11:32 into the first quarter. Shortly thereafter, LB Kurt Allerman blocked Tom Blanchard’s punt and on the first play of the second quarter Morris scored again on a nine-yard draw play. At 21-0, it seemed as though a rout was in progress. However, New Orleans began to get back into the game after DT Derland Moore recovered a fumble by Terry Metcalf at the St. Louis 46. A 15-yard unsportsmanlike conduct penalty on DT Mike Dawson erased a loss by the Saints on the first play from scrimmage after the turnover. Two runs by FB Tony Galbreath got the ball to the 19 and from there HB Chuck Muncie ran for a touchdown on a sweep to the right. The Cards responded with Metcalf returning the kickoff 51 yards to the New Orleans 44. The fleet halfback followed up with a pass reception for 11 more yards and two carries by FB Jim Otis advanced St. Louis to the 21. But after catching a pass from Hart, TE Jackie Smith fumbled at the eight and DE Joe Campbell recovered for New Orleans. The Saints proceeded to drive to another score in eight plays. Muncie gained 22 yards on another sweep and QB Bobby Scott, the replacement for Archie Manning, passed to backup TE James Thaxton for 20. Thaxton caught a pass from Scott for a 25-yard touchdown and with another successful extra point New Orleans was only a TD behind. Following a punt by the Cardinals, the Saints drove 80 yards to the tying touchdown. Scott threw to TE Henry Childs for a 53-yard TD and the teams went into halftime tied at 21-21. The Cardinals moved back in front on their first series of the third quarter. They drove 70 yards in 14 plays, eating up 7:44 off the clock in so doing. The highlight of the drive was a Hart pass to HB Jerry Latin for 14 yards to the New Orleans six. Morris ran for five yards and then leaped into the end zone from a yard out for the touchdown. The Saints roared back with a drive from their 24 to the St. Louis five. However, the Cards held as Scott tossed three incomplete passes and New Orleans had to settle for a 22-yard field goal by Rich Szaro that narrowed the home team’s margin to 28-24. In the fourth quarter, the Cards scored again on an option pass from Metcalf to Gray that covered 11 yards. New Orleans kept pace as Scott passed to Childs for a 29-yard TD with 7:18 left to play. The Cardinals finally put the game away with just over a minute left on the clock as HB Steve Jones scored from a yard out. That possession was helped along by a fake field goal attempt in which holder/CB Roger Wehrli ran for 19 yards and a first down. They padded the lead following an interception by CB Lee Nelson when Morris scored his fourth TD with a 12-yard run with 44 seconds to go. Wehrli intercepted Scott’s final pass of the game to end it and St. Louis came away with a 49-31 win that, for most of the game, was closer than the final tally indicated. The single-game total of 49 points was the most for the Cardinals in 12 years. They led in total yards (487 to 440), including 244 on 52 running plays, and first downs (31 to 23). Each team turned the ball over twice. Jim Hart completed 17 of 24 passes for 225 yards with a touchdown and none intercepted. Wayne Morris had a notable performance, rushing for 95 yards on 25 carries that included four touchdowns. Terry Metcalf added 78 yards on 17 attempts, caught 5 passes for 62 yards, and completed both of his option passes, including one for a TD. Mel Gray also gained 62 pass receiving yards on three catches that included two for touchdowns. For the Saints, Bobby Scott (pictured below) was successful on 16 of 35 throws for 285 yards with three TDs but also two interceptions. Chuck Muncie ran for 102 yards and a touchdown on just 13 carries. The two tight ends were the most productive receivers for the club as Jim Thaxton had four pass receptions for 83 yards and a TD and Henry Childs caught three for 79 yards and two scores. “We (backs) moved the ball real well, but the line did a fantastic job,” said Wayne Morris. The win evened the Cards’ record at 3-3 and put them in a three-way tie for second in the NFC East with the Giants and Redskins behind the Cowboys. It was also the second of six consecutive wins, but after peaking at 7-3 the team lost four straight to fall out of contention and end the year at 7-7 and third in the division. The feud between owner and coach led to Don Coryell departing afterward. New Orleans won the next week against the Rams but ultimately finished at the bottom of the NFC West with another losing record at 3-11. Hank Stram was dismissed afterward. Terry Metcalf ranked second in the NFL in all-purpose yards with 2022 that included 739 on 149 rushing attempts (5.0 avg. ), 403 on 34 pass receptions, 772 on 32 kickoff returns, and 108 on 14 punt returns. He was selected to the Pro Bowl for the third time. Having played out his option, he jumped to the CFL for 1978. Wayne Morris ended up running for 661 yards on 165 carries and caught 24 passes for 222 more yards. His four rushing TDs against the Saints were half of his season total of eight, and he had one pass receiving touchdown to give him nine on the year.